It’s a bird, it’s a plane, no…it’s a flying dragon. With a final push in the last two weeks, all three dragons took flight and delivered the egg to its nest. On the Baby Harley team Juliana and Tommy added supports to their dragon’s neck and head. On the dragon you ride in team, Olivia focused on attaching the dragon head. Peter discovered that clamps are great for attaching perpendicular pieces. Meanwhile, Asher added wings to the dragon you ride under team’s dragon. After Asher was done with that, he and August added screw supports for the structural safety of their dragon, on both the underbelly and the neck. Then - before we all knew it the final day was here! We did a couple of safety tests then we soared across the school in our dragons. The under team went first, with Katie on board to test, and…it worked! Caulder tested the fire dropping mechanism on his team’s dragon while loading up the next tinkerer on board. Each team got to ride on their own dragon. Jackson, used his team’s egg catchment system successfully deliver the egg into the nest. Next up were the dragons you ride in team. Clay and Skylan rode together first, followed by Olivia and Adele, and Peter and Nick. All three pairs successfully dropped their egg into the nest as well! Last and certainly not lease, the Baby Harley team got their turn on the zipline. Hold on tight - this dragon goes fast! After a day of fun and successful dragon riding, our tenacious tinkerers went home knowing the satisfaction of eight weeks of hard work and fun. See you all around next time! And don’t forget to check out all the photos from our flying dragons tinkering session! Our dragons left the ground for the first time today! They may not have their wings yet, but our tinkerers wanted to test how well the dragons took to being in the air. Before the testing began though, there was lots of building to be done! Asher and Jackson finished securing the roof on their team’s dragon. Adele and Daphne also completed their awesome dragon egg nest! August recruited Jackson to help him build some cross supports for the dragon head he’s been carefully crafting. The team building the dragon that will carry riders inside its belly made lots of progress thanks to lots of teamwork and extra focus. Peter worked on repositioning some eyebolts that the zip line ropes will attach to and Nicholas learned how to use a hot knife for cutting through and sealing the ends of synthetic rope. Olivia was excited to use the band saw! It’s tricky to keep the blade moving along a line, but with her sharp eye, she made some super precise cuts to make pieces for her chair. Meanwhile, the small “baby” dragon team worked hard to finish installing the hardware that the zip line ropes will attach to. And then the testing began! Whooo! It worked and Tommy proved it can support lots of weight!! The team building the dragon that carries riders under its belly also completed their frame and suspension points. It was incredible to see their very large dragon body raise up into the sky! The rider cockpit is going to be so much fun to ride in. There’s even a side window! With only two more weeks left of our Tinkering after school session, our hardworking crew is eager to give our dragon skeletons wings, heads, tails, and so much more. The dragons have been slowly incubating over the past six weeks and you wont want to miss them as they hatch and take flight! And don’t forget, all the fun photos from the day and previous weeks can be seen on our Flickr page! We have a zip line! It’s been a long held dream here at our Tinkering School workshop, and now we finally have an 80ft zip line running through the workspace :-) We couldn’t be more excited to have this enthusiastic crew of tinkerers help us test it out. One of the teams made the first attempt to suspend their dragon’s frame on the line. It took the coordination of everyone to raise it up and figure out how to attach the support ropes to the zip line pulleys. There was lots more planning and fine tuning to be done as well. Some of the kids also tried their hand at using some pull saws to trim up some uneven joints on the frame. The team constructing the “riding below” dragon also made lots of progress. Jackson showed August the rider cubicle that will be attached under the dragon’s belly. Adele joined Daphne’s project, helping build the dragon nest. August and Emma had a fun challenge in figuring out how to attach their dragon’s jaw to the rest of the head so it moves! And the final dragon team nearly completed their dragon body. The team carefully measured and cut their plywood paneling and they were amazed to see it all fit together like a puzzle! It pays off to take time and make precise measurements and straight cuts. Truman proudly demonstrating how the dragon horns he cut out will attach to the dragon’s head. They will also function as handles for the rider. With only a few more weeks left in the session, the kids are super excited to begin test riding their dragons as well as figure out ways to collect their dragon eggs mid flight! For more photos from the week and the rest of the session, you can visit our Flickr page. See you next week! Our dragons may not be flying quite yet, but they took a giant leap forward today! The “riding above” team completed their frame/seat. The pieces fit together perfectly thanks to the team’s careful measurements. It may be the smallest of the dragons, but it will be exciting to ride on its back as it flies down the zip line which will be almost 80 feet long! This team is a picture of awesome collaboration at work. They took turns helping each other hold down wood while the other drilled, they generously shared their tools, and they made sure everyone’s ideas were heard. They’re so organized, they even started planning next weeks task list all on their own! Calder helps August attach the supports to connect the sides of the head to make it “3D”. The head will eventually be attached to the neck and frame. Its going to be a very large dragon! Daphne tackled the very important task of building the dragon’s nest that the dragons will have to deposit their eggs into at the end of the zip line. Such a creative design and Daphne discovered it will provide lots of great drilling practice. The “riding inside” team also finished the floor of their dragons belly and even had time to attach large eye-bolts that will be used to hoist the dragon in the air and attach to the zip line pulleys. Our young tinkerers had a lot of fun using the really big drill bits to make holes large enough for the eye-bolts. It’s fun to drill holes, especially holes so big you can easily see through them. So much fun was had by all this week! And wow did these teams make a ton of progress on their projects through the process. We can’t wait to see what they accomplish next week! To see more fun photos from today and previous weeks, be sure to visit our Flickr page! Rawwwr! With our tool training and design planning behind us, this week we had all a full session of tinkering and building! We met with our three dragon groups for a few minutes to make sure we were all on the same page, and then it was time to get our tools and materials. The kids raided “scrap alley” for pieces of plywood. Some were really heavy and long so all hands were needed. When plywood pieces aren’t the perfect size, we have multiple different saws we can use to cut them into the shape we need. Jackson learned how to safely use the band saw and had lots of practice cutting straight lines as he had multiple pieces he needed to trim. August used the jig saw again to continue cutting out the shape of a dragon head for his team’s project. He learned how he can cut more intricate designs with the jig saws’s smaller blade. And Daphne had lots of practice using the chop saw cutting up pieces for the dragon egg nest. As the dragons fly down the zip line, they will pick up a dragon egg midway and deposit it in their nest at the other end. Adele and Asher teamed up to construct the body for the “riding under” dragon. They used a variety of clamps to help hold the pieces of wood together and took turns screwing and drilling. So efficient! 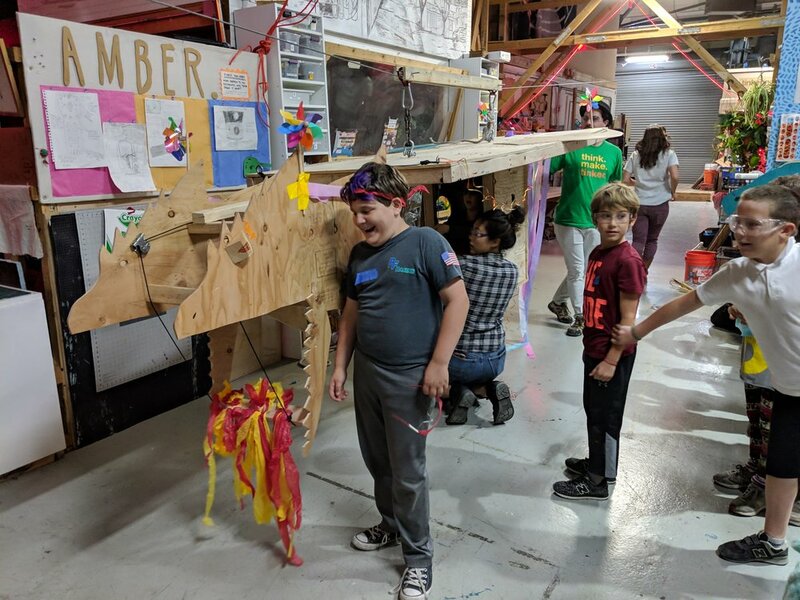 Meanwhile, the “riding inside” dragon team got to work building their own frame and attaching a solid floor that could hold up multiple riders. There were lots of opportunities for everyone to practice their drilling technique. The team also came up with an ingenious way to craft a curved body for their dragon. The PVC pipe is attached to the floor with long bolts. Olivia estimates if she’ll still fit inside. The “riding above” dragon team also made lots of progress constructing the ribs and frame of their dragon. Holding down a piece of wood is accomplished with a variety of methods: clamps, a vise, a helping hand, and as Truman demonstrates, using our entire body weight can be helpful sometimes too! The satisfaction of precision in action :-) A simple frame built precisely can be more challenging to construct than we might think. Juliana also had a chance to try out the band saw. Sometimes with a longer piece, a helping hand is needed. Thanks Truman! While Juliana guided the wood through the blade, Truman kept his hands flat underneath the board, holding it up level with the table. We saw so many examples of great collaboration and teamwork this week and the projects are rapidly taking shape as a result. We’re super excited to soon be testing out how well these dragons fly down the zip line. To see all the fun, be sure to check back next week and don’t forget to visit our Flickr page!